Mario Kart 8 was one of the very few bright spots of 2014 which really struggled as gamers were moving on from one generation to another. It was my personal Game Of The Year, and was by far the best game I had ever played on the Wii U. When the Nintendo Switch was first revealed, the idea of playing a game like Mario Kart 8 on the go was a huge selling point and reason why I bought the Switch. I know, buying a console for a port seems too much but this is Mario Kart 8 we are talking about here. We are talking about one of the best games I’ve ever played too. Mario Kart 8 on the Wii U was already a beautiful looking game, with one of the best art directions I’ve ever seen in a video game. The Switch version makes it look that one step better, and that one step extra is enough to make you think “Wow! This games looks unbelievable” that’s until you get hit by a barrage of those nasty red shells, fall to 12th place, and curse up a storm in classic Mario Kart fashion. I was surprised with how well Mario Kart 8 Deluxe ran in the handheld mode. It was a smooth 60FPS with no noticeable drops, and was also as visually stunning as playing on the TV. Mario Kart 8 Deluxe has already made my long haul trips way more bearable, and I can say for sure that it will continue to do so for the next few years. That’s why you are going to get your money’s worth with this game. Whether you’ve played the Wii U version or not, you are going to get an incredible amount of replay value that few games can these days. 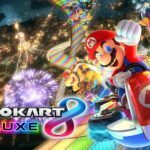 Why does Mario Kart 8 Deluxe have so much replay value is something you might be thinking, well the simple answer to that is because it’s extremely addictive. It also helps that Mario Kart 8 Deluxe has the most content in a Mario Kart game ever with a huge roster of characters as well as racing tracks. 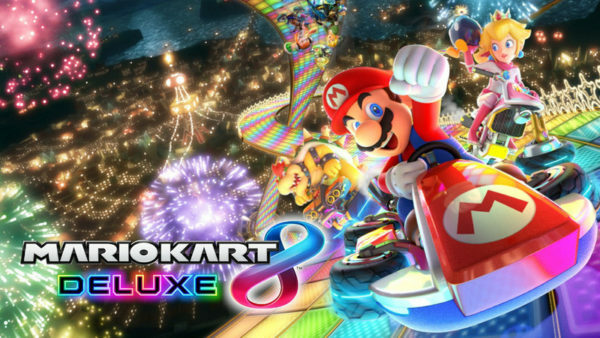 This truly is the ultimate Mario Kart experience, and all I can think is “how can it get any better than this?” I would be more than happy for more Mario Kart 8 DLC for years to come rather than a new game because Mario Kart 8 Deluxe is the perfect Mario Kart game. Now perfection in video games doesn’t come without some issues, and we can all agree on that because no video game is perfect. I did notice there are some issues with the online features in the game, disconnections can be much too frequent at times too. It’s a shame because when the online features are working fully, it’s one of the most addictive online games that I’ve ever played by far. I’m just going to say it right now, Mario Kart 8: Deluxe is a 10/10 game. Does it have its issues? Of course but I don’t believe any game is issue free but if a game can keep you entertained for this long, and will continue to do so for many more years to come then it’s a 10/10 game in my opinion. If you have never played Mario Kart 8 before then please go out and buy a Switch if you don’t own one already, and enjoy playing one of the best games of the last decade. I'm playing it and enjoying it 3 years later, the replayability of this game is incredible.